Abu Dhabi: The number of Nepalese in the UAE has remained steady during the past two years, despite global financial meltdown, according to the Nepalese Ambassador to the UAE. "Official figures in 2008 September showed that there were 125,258 Nepalese in the UAE and we have confirmed that the number has been steady during the past two years", Arjun B. Thapa told Gulf News on Sunday in an interview. A majority of the Nepalese are living in Dubai- around 75,000, he said. "Although most of them are working in the construction sector [as workers], we have not received any reports on job losses," Thapa said. About 30,000 Nepalese are living in Abu Dhabi and rest of them are in the northern emirates, he said. At least 45 per cent of the total population [of Nepalese] is working in the construction sector, the ambassador said. "Many of them work in hospitality and security services [as security guards]. The rest of them are professionals," he explained. Nepalese security guards are very popular in the UAE for their trustworthiness, Thapa said. The embassy always takes up the complaints from the community members with the local [UAE] authorities which have been helpful and supportive, he said. Nepal has banned the emigration of housemaids to several foreign countries including the GCC nations, he revealed. "But sometimes they [housemaids reach the UAE illegally and approach the embassy for help. We give shelter to those women and send them back home," the ambassador said. Since Nepal does not have a consulate in Dubai, most of the community members from the northern emirates depend on the embassy in Abu Dhabi for consular services like passport renewal, he said. "Although we entertain applications by post, most of the people from the northern emirates visit the embassy in person. 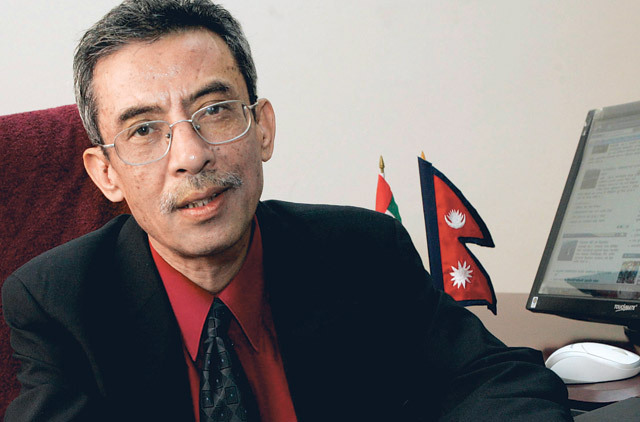 But we issue renewed passports the same day," Thapa said. The ambassador disclosed that Nepal does not have a plan to open a consulate in Dubai at the moment. Several informal organisations are active in the Nepalese community which also link the embassy with the community members, he said.